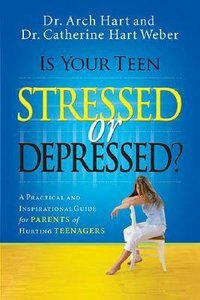 About "Is Your Teen Stressed Or Depressed?" Dr. Archibald D. Hart is a clinical psychologist and senior professor of psychology and dean emeritus of the Graduate School of Psychology, Fuller Theological Seminary in Pasadena, California. He also serves as the president of the International Network for Christian Counselors. Dr. Hart is an internationally known speaker and author of twenty-four books, including Adrenalin and Stress, Stress and Your Child, Helping Children Survive Divorce, The Sexual Man and The Anxiety Cure. He and his wife, Kathleen, live very happily in Southern California, surrounded by their children and grandchildren. Archibald D. Hart, Ph.D., is licensed in the state of California as a psychologist and board certified in Psychopharmacology. He is Professor of Psychology at Fuller Theological Seminary and the author of numerous books, including "The Anxiety Cure" and "Helping Children Survive Divorce." Catherine Hart Weber, Ph.D., is a licensed marriage and family therapist, specializing in psychotherapy from a Christian perspective. The coauthor of Secrets of Eve, she writes and speaks on topics relating to marriage, parenting, sexuality, and personal wellness. Customer Reviews For "Is Your Teen Stressed Or Depressed?" The book title poses a very good question - are they depressed? or just stressed? - and provides brief questionnaires to assess either, and practical tips to tackle both potential problems. Comprehensive  easy to read for non-professional counsellors. Have kept this on my bookshelf  pulled it out to help me with encounters with multiple youth.